A spontaneous remark that is invented and presented on the spur of the moment without previous thoughts about it. Literally meaning is "at pleasure". 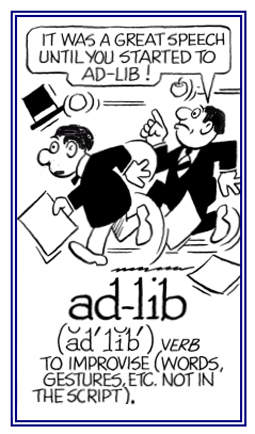 This expression is popularly used as a noun phrase or modifier in English in the form "ad lib" to express absence of planning; for example, "His worst jokes were carefully planned ad libs."